But you can downgrade and reformat for an older version of macOS. I’ve written quite a bit about the not-quite-so-new Apple File System (APFS) format that Apple adopted for both iOS and—with macOS 10.13 High Sierra—for SSDs that are a Mac's boot volume. While questions have largely tapered off in recent weeks after a spate of issues with Time Machine, APFS, and external drives, people are clearly still wrestling with some of the details. A Macworld reader can’t get the HFS+ option to appear, but that’s by design. Macworld reader Andrew wrote in asking about reformatting his High Sierra system, and wanting to choose HFS+ (Mac OS Extended, Journaled). However, after booting into macOS Recovery, the Disk Utility app only offers up APFS options. Why is that? MacOS Recovery is in sync with High Sierra, and Apple converts a boot SSD volume into APFS when you install High Sierra. While that was optional during High Sierra’s public beta period, it became mandatory and unavoidable on release. 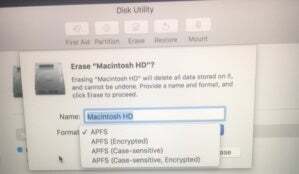 As a result, even trying to erase a boot SSD volume only presents APFS options. It’s possible you could force HFS+ on a boot SSD with High Sierra with some Terminal monkeying around, but I can’t see that would end well, and I’m not sure it offers any advantages. It’s too risky to recommend. However, if you’re trying to downgrade to Sierra or an earlier version of macOS, I would create a bootable installer of that version of macOS, start up your Mac from it, and then use Disk Utility within Sierra or earlier to reformat the SSD with HFS+. Then you can install previous versions of macOS on that Mac.